Why Do You Need a Burglar Alarm? Your possessions are typically replaceable, but your family, pets, and peace of mind are not. ADT monitoring services can make a difference in your life, even if you never experience a break-in. When you invest in a burglar alarm, you’re also investing in a lifestyle with less worrying. ADT monitored home security is advanced, reliable, and available at a price your family can afford. You have the option to integrate as few or as many features into your personalized home security system as you feel necessary. Below are four ways that an ADT monitored burglar alarm can help you. No matter your living situation, the possibility of a burglar invading your home while you are there is a frightening thought. With ADT monitored home security systems, you’ll never be completely alone. If your alarm goes off for any reason, an ADT monitoring representative will be available and will stay on the phone until help arrives. Even if your children are old enough to stay home alone, there are still situations that even the most mature children can’t manage on their own, like a home invasion. You trust your children, but the added protection of an ADT monitored burglar alarm with a 24-hour monitoring system can help ease your mind during those long days or late nights when you cannot be home with your kids. Dogs can help deter burglars or would-be intruders and provide you and your family with companionship. Pets make your home a better place and do what they can to protect you, but don’t make them do all of the work. There are many events and emergencies that your pets are not able to handle. An ADT burglar alarm can help protect your pets when you’re not around. If there is a break-in or a fire, and your pets are in the house, you will want your security provider and the appropriate emergency services notified and dispatched to your home immediately. Pets have no way of helping themselves in these situations unless they can go outside, and you can’t guarantee they’ll do that, even if it is an option. According to the Federal Reserve Bureau, the average annual homeowners insurance premium is between $300 and $1,000–that’s expensive! You may get up to 20% off your homeowners insurance if you install an ADT monitored burglar alarm in your home. Remember to ask your insurance agent about possible discounts. ADT has been helping to protect people since 1874, which is longer than any other company in the electronic security industry. From ADT messengers and call box operators, to the invention of a hands-free wireless keypad and control panel, monumental advances continue to be made in home security technology. Since the early 1900s, when Customer Monitoring Centers were first introduced, businesses have trusted ADT to protect their money and confidential documents. Likewise, homeowners have trusted ADT with the safety of their homes and families for years. So why should you trust ADT? ADT lives up to its mission–to create lifelong customers by adhering to four core values: trust, collaboration, service, and innovation. What Do You Get With Your Burglar Alarm? ADT’s 24-Hour Alarm Monitoring provides you with around the clock security and fast responses. Thanks to the finest home security equipment, you’ll be able to enjoy your days away from home and sleep well at night knowing ADT is helping to protect your home. What Equipment is Available with an ADT Monitored Security System? Wireless Keypad and Control Panel–This is the central point of every ADT monitored security system, allowing you to control your entire system from one location. Door/Window Sensors–These sensors detect the opening and closing of windows and doors, the most common entry points for burglars. Pet Immune Motion Sensor–The Pet Immune Motion Sensor prevents false alarms caused by pets weighing 80 pounds or less. 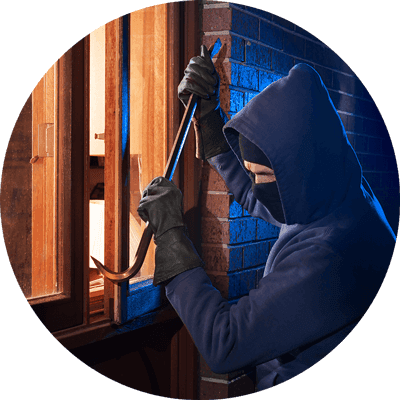 ADT Yard Signs and Window Decals–Sometimes using these yards signs and window decals are all it takes to scare away an intruder. However, it’s become a well-known trick to use them without actually having an alarm system, so more burglars are starting to ignore them. Therefore, the added protection of a burglar alarm will help give you a more genuine sense of security. Key Fob–Among the key fob’s programmable functions are the abilities to arm and disarm your system, call for help in the event of an emergency, and lock and unlock doors. 2-Way Voice–This feature allows you to speak with an ADT dispatcher through the wireless keypad from up to 75 feet away. This is a great feature for the elderly who may not be able to reach the keypad in an emergency. Also, the moment the alarm system is triggered, the dispatcher can hear what’s happening in your home and determine if someone is in danger. CellGuard®–CellGuard® doesn’t require any drilling or wire installation in your home. CellGuard® uses wireless technology instead of telephone lines to connect your alarm to ADT’s monitoring network, so you don’t have to worry about your home phone line being disconnected by a burglar or power outage. This wireless burglar alarm system is an especially important benefit of ADT’s monitoring packages, because many families now use cell phones instead of home landlines. Check out our pricing page to decide which ADT monitoring package best fits your family’s needs.